When I started this blog almost two years ago, I had a vision, albeit a blurry one, of what it would be about. I wanted to design original knitting patterns, share them on Ravelry and improve my skills by knitting larger and more complex items. I did end up designing a few things. Nothing terribly complicated, just some easy scarves, bags, booties and fingerless gloves. My mesh bamboo scarf is the most viewed page on my blog, and with the arrival of cold weather the gloves are getting a little bit of attention. 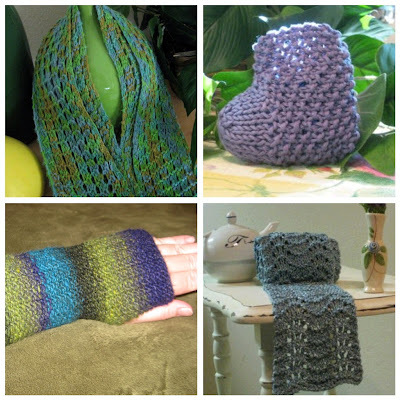 It's gratifying when someone knits one of my patterns and posts the project on Ravelry. But it's been a while since I designed a pattern. And I've not attempted to knit anything too big or complicated since I started this blog other than a lace shawl (which turned out to be rather small and easy). At this point in time, I'm knitting garter stitch scarves. Garter stitch scarves. The kind that are your very first knitting project, the kind that are supposed to get monotonous after you've made one for each member of your family. I've read enough knitting books to understand that garter stitch scarves are kindergarten knitting; they are the finger painting of the fiber world. But the truth is, I like how they look and enjoy knitting them. I don't have to remember to use my row counter or glance at a pattern every few minutes. It's like being transported back to a simpler time before you knew about tricky techniques like a Turkish cast-on or three-needle bind off, when you had no idea how to use circular needles and didn't care, when terms like K2TOG and YO made your eyes glaze over. In those days, knitting with acrylic yarn was perfectly acceptable and the smallest needle size in your collection was maybe a US 6 (but you never used it). So here I am, finger painting scarves while forgetting how to do a proper wrap and turn. Simply knitting. While I do plan to return to the world of purl stitches, yarn overs and short rows, for now the basic act of creating something with two sticks and some pretty string is enough. 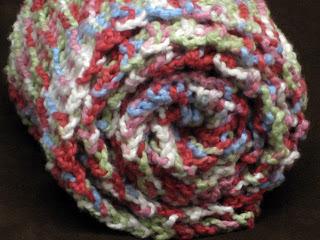 I love your blog I am going to knit your scarf pattern next, or maybe after my christmas present making session. Thank you for your patterns. I love the garter stitch. I always have a project in my purse so when I am riding or waiting in line, I can get few rows done, put it away without any worries, then pick right up on the next trip. I love your patterns. The mesh bamboo scarf is on it's way to my sister's as I type. Thanks so much Stacy for sharing. My friend knits scarves all the time. Just like you, she does the garter stitch. However she uses different yarns, different yarn combos and ANYTHING on sale. She gives these away by the dozens. She knits for the FUN of it - and shares her love by handing them out as someone comments about them. She's as about as content as can be. Ahhh...simplicity. I could use some of that. Life is just getting too complicated! The things we do for relaxation and joy should not become competitive. Your knitting is beautiful. 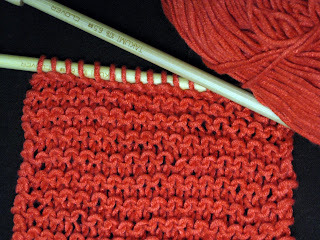 There's a reason that garter stitch is still popular - it's fun and easy, but it's also very pretty. ps did you see on my garden blog I caught a goose in flight..with my camera of course!...and I was just gartering!!! I still love to knit garter stitch scarves, too. With color they can be amazing and that bliss that comes from falling into the perfect knitting rhythm is sure to occur. Oh, goodie you are back with me in pre-school with our garter stitch scarves. I actually really enjoy knitting them. Mindless at the end of a busy day. Enjoy you evening and day off tomorrow. But they're oh so pretty! I think we all need to go back to the easy stuff now and then -- to relax and let our hair down! hey stranger...i love your reflection in your last post regarding 'savouring' what we do...not hurrying..but enjoying what we are learning and/or achieving. Looks though that you are achieving lots. Simple can be beautiful. I love how BrooklynTweed is always using garter in his designs. I say it's all good. if you like it and it relaxes you, no one else will judge. I admire complicated quilt patterns with lots of stars and what have you in the mix but I stay away. Why? Because they will drive me crazy and I will get frustrated. I want to enjoy my hobby. Not start to hate it.